Here is a holiday season story (RUS) that's got very little of the traditional holiday spirit in it. Posted by LJ user souffrante and accompanied by Valeriy Leushev's photos, it's as much about Russian bloggers' childhood memories as it is about globalization, consumer nationalism, bad management, labor rights and the power of blogging. Do you know how the real [Christmas] balls are made? Imagine a huge factory, with huge machines puffing, spitting out identical shiny balls, then a conveyer belt with these balls moving on it, and then ultra-modern pulverizers pouring paint over the balls, and then, as they enter a special chamber, special squirts of paint are being sprayed on them from all directions, creating a complex pattern. As the balls continue on their way along the conveyer belt, they get fanned over and dry fast. And finally, at the very end of the conveyer belt, they fall down into boxes in straight rows and are sealed down by a robot, the wonder of modern technology. And now stop thinking about silly thoughts. Take a glass ball that was made at Yolochka [Little Fir Tree] enterprise and look at it closely, try to sense WHAT it is that you're holding in your hands. Feel the soul that the Russian women - often disabled - have poured into it, the women who have been working at the Christmas tree decorations factory for many-many years, bringing festivity into every home. These people have made this ball WITH THEIR HANDS. With their hands alone. So do you know how the real [Christmas] balls are made? I'll tell you. So that you don't feel like buying ugly Chinese-made plastic [mass-produced trash] anymore. By the end of the Soviet period, the factory acquired automatic equipment, but it never got installed and, in the years of the economic decline of the 1990s, it became inoperative. The factory drops you into the atmosphere of the first [Five-Year Plans], or perhaps even the end of the 19th century. New Year's decorations are being created in the toughest of conditions. It's hard to stand the lack of fresh air and the burning hot air of the tiny rooms where glass forms are blown - yet this is where people spend the whole day working. Some elderly female worker even like to scare their grandkids this way: "If you don't study well, you'll end up working at Yolochka!" The first section of the factory is the hot one. Here, 50 female glass-blowers toil in semi-darkness, noise and heat, for 6-8 thousand rubles [approx. $240-320] a month, mouthblowing decoration molds with the help of gas burners. Their workday lasts eight hours. In this time, each worker has to produce 200-250 molds, depending on the form of the future decoration. What's difficult to achieve is the preciseness: the ball's diameter, for example, cannot deviate for more than 1-3 mm. It's impossible to work here without some special instinct. If the result is somewhat distorted, the ball is thrown away. To become a good glass-blower, one has to study for six months and then work for no less than two years. Here, all decorations are painted by the real masters. Hand-painted. Sometimes it takes a few hours to complete one ball, and sometimes the whole day, depending on the complexity of the picture. There is an extreme shortage of masters. It is not easy to learn this craft. The balls are packed and delivered to stores, where they are being pushed away from the shelves by the Chinese plastic that's being produced by millions by the soulless machines. And these balls are handmade, practically each one of them is unique! Exclusive stuff, being sold for 100 rubles [$4] apiece. Foreigners take away bags of these balls when they come to the factory on a guided tour - in Europe such a miracle would cost [a lot more]. To avoid offending the Chinese, all this stuff could be hung on their mass-produced artificial fir trees. Thank you for the story! I'll definitely buy these decorations now! The make boxer pants the same way. Only there are no glass-blowers there, though the rest is the same: sleepy hens dressed in green robes sit behind sewing machines that grew outdated a hundred years ago, with paint peeling off them, and work with their hands, with their hands - handmade. And the result is the same: pale, unappealing Soviet nothing that no one wants. My mother used to work at a Christmas tree decorations factory in the Soviet times. And until I was 7 or so, I thought that she knew Ded Moroz [Father Frost, Santa Claus] in person. 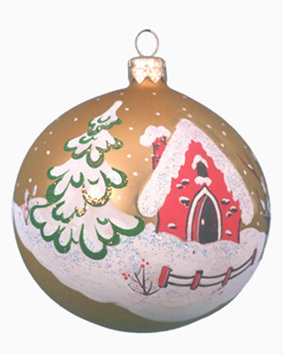 That [Christmas] balls in Russia are made manually is nothing but a sign of backwardness of our industry. Mass production of decorations shouldn't be manual. Only exclusive decorations. Yes, you're right - it would've been easier for them to arrange export of smaller quantities and get a lot more money for it, than force the disabled to toil for kopecks - though [...] where else would a disabled person go. [...] And, just like you, I'm sure no one here would buy one ball for 2,000 rubles [$80]. In a civilized country, people like these would be living a lot more decently. In a "civilized" country people would be living the same way. But the factory would have an owner instead who'd be buying himself a yacht every year. And we'd paying a hundred for a ball, right. A hundred euros. No, no, I'm not hinting at anything. Even if you've been paid to do it, it's still very sincere! No one paid anything for this, okay... We were just working on an innovation management case at the university, using this company as an example. And we got so emotionally involved with it that we decided to help in some way.